Everything in Arugula's world was just so. Her house was clean and bright. There were no weeds in Arugula's garden. Her quills had just the right shine and bounce. Does Arugula yearn to share her wonderful world with her friends? W-e-e-l-l, not exactly. It's more like Arugula wants to show off her perfect house and garden, her lovely things, and her elegant cuisine. She plans her menu--watercress sandwiches, cream puffs, strawberry cake--and invites everyone she knows--except for Fidget the Squirrel, whose energy and brashness Arugula finds quite annoying and no small danger to her fine china! Finally the big day arrives. Arugula put the finishing touches on her showpiece--the strawberry cake--and just has time to freshen herself up before the guests begin to arrive. At first the invitees are impressed with Arugula's home and tea table. But the hostess seems more concerned about a chip in her fine teacups, or a nick in her antique teapot, or crumbs on her carpet, or an imperfectly sliced piece of cake to permit her guests to relax and have a good time. Just as they are looking around for an excuse to take their leave of their obsessive hostess, however, Fidget arrives in a burst of energy. "Hey, everybody! Let's get this party started!" It's high anxiety time for Arugula as Fidget breaks out his favorite party tricks--juggling her precious teacups and balancing the elegant cake on his nose. "Don't try this at home!! "There's just one thing this party is missing! DANCING!" Despite herself, Arugula suddenly realizes that her guests are really having a good time--and so is she! Her party is now really perfect. 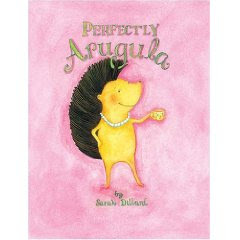 Sarah Dillard's Perfectly Arugula (Sterling, 2009) is a great reminder that those who are obsessive about having the arrangements perfect sometimes overlook what makes a party itself perfect--fun for everyone, including the hostess. Dillard lays out many of her pages like a comic book, with thought balloons revealing what the guests are really thinking, a device which adds to the irony as Arugula mentally compliments herself on her faultless food and decor while her guests fidget nervously and try to come up with a polite reason to leave. Perfectly Arugula is a humorous book with a small but important message about hospitality.